When: Wed., May 1, 6-9 p.m.
Price: $25 with discounts available for students, seniors, and groups. Contact us at kassiaensemble@gmail.com to ask for more information. 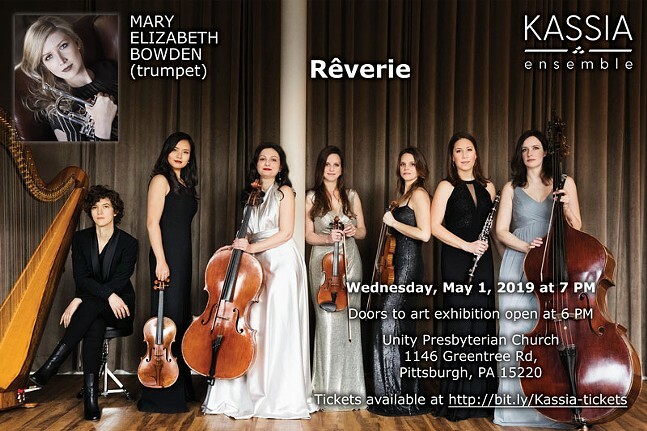 The Kassia Ensemble, an all female, classical chamber music group, presents "Rêverie", a concert of French and American music. The program includes a mix of new works and vintage favorites, with a balanced inclusion of female and male composers. Trumpeter Mary Elizabeth Bowden joins the Kassia Ensemble in concert to celebrate their collaborative release of her second solo CD, “Rêverie”. The Kassia Ensemble promotes female entrepreneurship, leadership, and partnership in the arts, across the genres. Accompanying the concert is an art show featuring local female artists. Doors to the exhibition open at 6pm and the concert begins at 7pm.